Ruggles & Jeffery is a national building contractor based in Wickford, Essex. Since 1992, we have been providing refurbishment solutions to our clients in London, Essex, Kent, the Southeast and throughout England and Wales. When you choose Ruggles & Jeffery, our directly employed, long serving and skilled craftsmen can deliver an affordable, quality commercial refurbishment service whatever your Business. 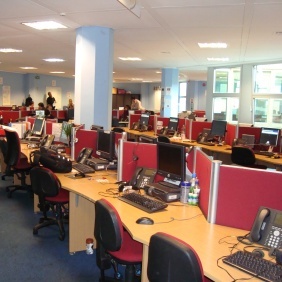 Our interior refurbishment services include office refurbishments and fit outs, toilet refurbishments and commercial and private kitchen installations and refurbishment. Our exterior refurbishments include repairing and installing roofs, laying car parks and replacing windows and doors. Many of our clients come directly from the Retail, Financial, Education, Healthcare, Commercial and Public Sectors. We also work very successfully with a many Architects, Surveyors and Facility Management companies including Carillion, Vinci, Norland Managed Services, Sodexo, SGP and Johnson Controls who are happy to recommend us to their clients. We have delivered high quality and affordable refurbishments and building maintenance on new buildings, listed buildings and heritage sites. Ruggles & Jeffery works in partnership with our clients to deliver high quality refurbishments and dilapidations with the minimum of disruption whilst maximising our client’s satisfaction. Our clients appreciate the quality and care that we pride ourselves on and the range of refurbishments that we carry out across different industries. We are able to work around our customers’ business hours and provide an evening, night and weekend service. Our sensitive approach together with our health & safety management allows us to operate in occupied premises allowing business to continue as usual.